If you cook often at home, you probably dread the heat that’s coming because you know you will be on the verge of suffocating whenever you cook indoors (which probably is every couple of days). Windows won’t help you much because it’s so hot outside. Besides, summer is already here and it’s the perfect time to grill and spend time outside. 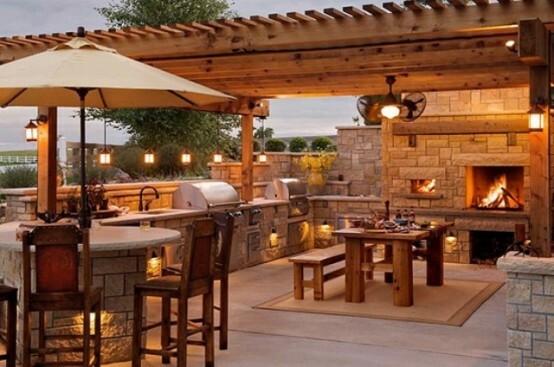 You are about to delight your eyes with 15 beautiful and fully functional outdoor kitchen designs that should get your imagination going. Unless you have experience or incredible talent to design outdoor kitchens with surrounding landscape, you should definitely turn to a professional designer. You will most likely need a permit to make these changes to your property and in order to obtain it, you have to submit a site plan. 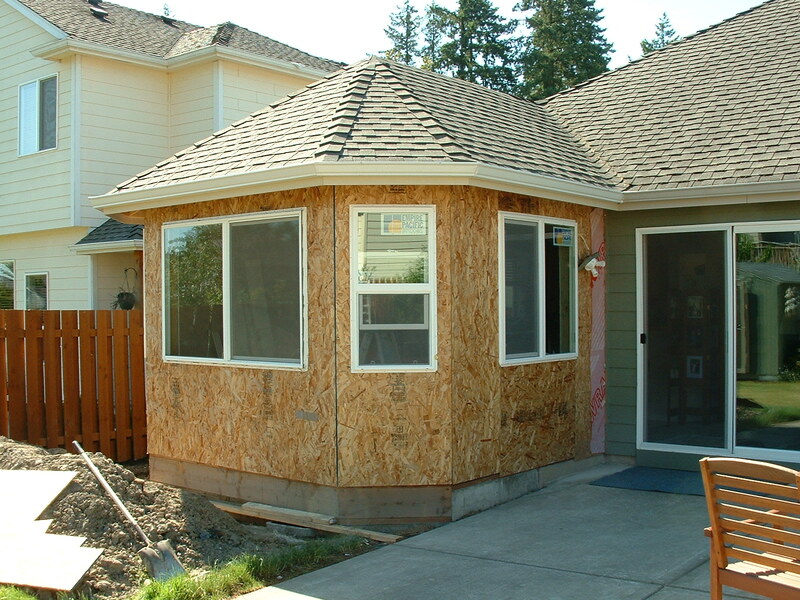 If you want experienced men to draft your site plan, rest assured that the team at 24hplans.com will get the job done in no time so that you can carry on with your home improvement project. They have affordable prices as well, but don’t take my word for it. Visit the site to see for yourself. The costs depend on how big and fancy you want to make it. Additional structures like pergolas and roofs will obviously increase the price. If you wonder why should you go through this big investment, here is a good enough reason. 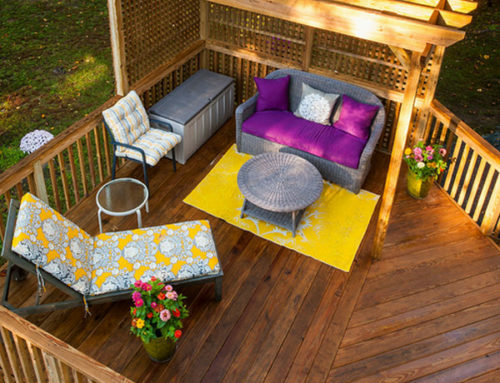 You will have a proper outdoor space to relax during summer days and evenings. Just think about all the grill parties you will have and the quiet evenings with your loved one cooking dinner for the kids who play around the backyard. Moreover, you will increase the value of your house if you are planning on selling it in the near future. 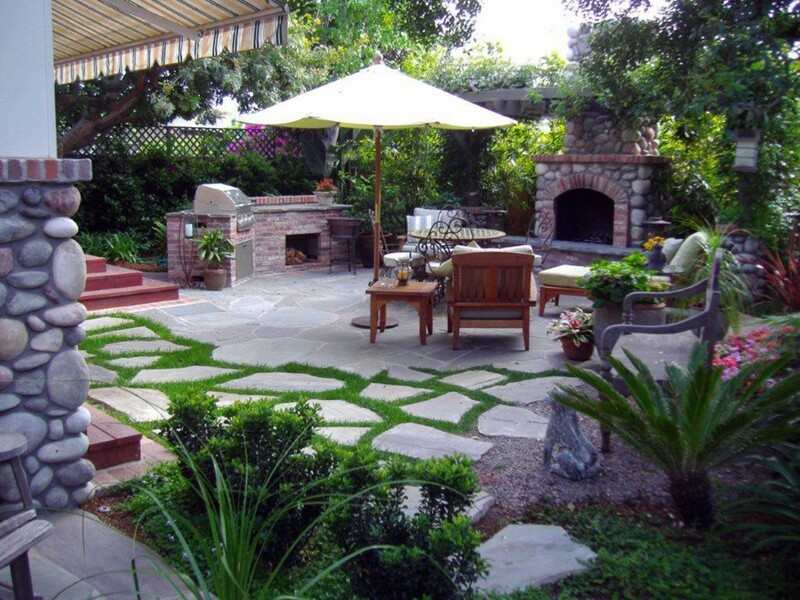 This design is obviously not one of the cheapest but it certainly makes your yard look cozier. 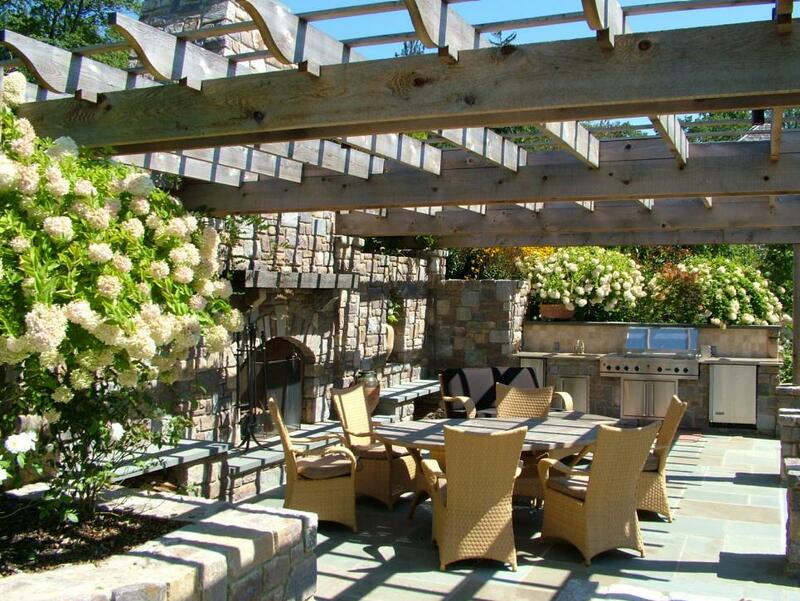 Assuming the pergola measures 12 ft. x 20 ft., it costs at least $7000. The framework seems to be made of manufactured stone which costs $20 per sq. ft.
Stone looks stylish and is resistant to staining. It is also heat resistant allowing you to build the wood fired pizza oven you see to the right. The cheapest oven costs $1500 if you take a look at some eBay products but you will notice they don’t look like the one in the photo. They are smaller and not as fancy looking, so the one in the image will probably cost more to build. The countertop looks like a type of limestone, maybe travertine. This is a great durable material that costs anywhere between $50 and $100 per sq. ft. Other types of limestone countertops require more maintenance than travertine. Also, expect to pay enough on lighting features if you want this design. The flooring looks like concrete. This material is durable, versatile and it can be colored so that it resembles natural stone. However, if you live in a cold climate you should stay away from concrete because it cracks if it’s subjected to repeated freeze-thaw cycles. It costs about $10 per sq. ft. 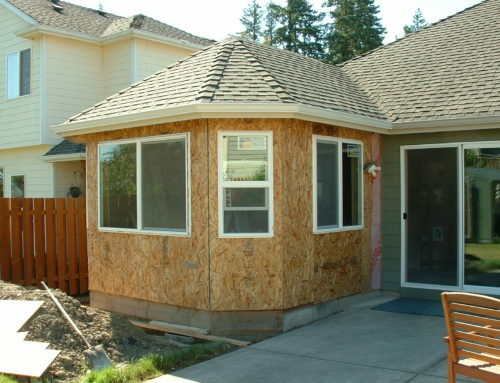 This design is perfect for those who want to build something beautiful but are on a tight budget. The natural stone floor costs about $25 per sq. ft. and gives an elegant and rustic look to this space. 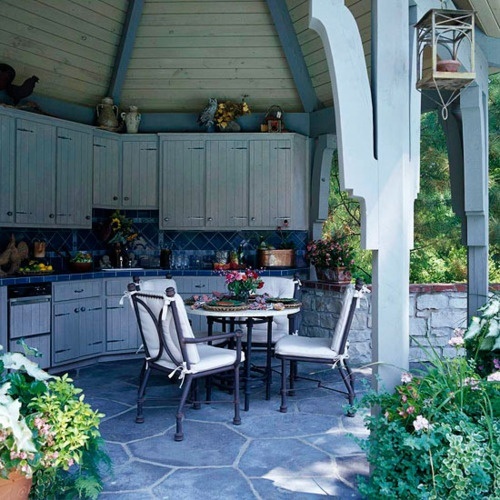 The entire kitchen seems to be sheltered by a gazebo which will provide the shade you seek during hot summer days. 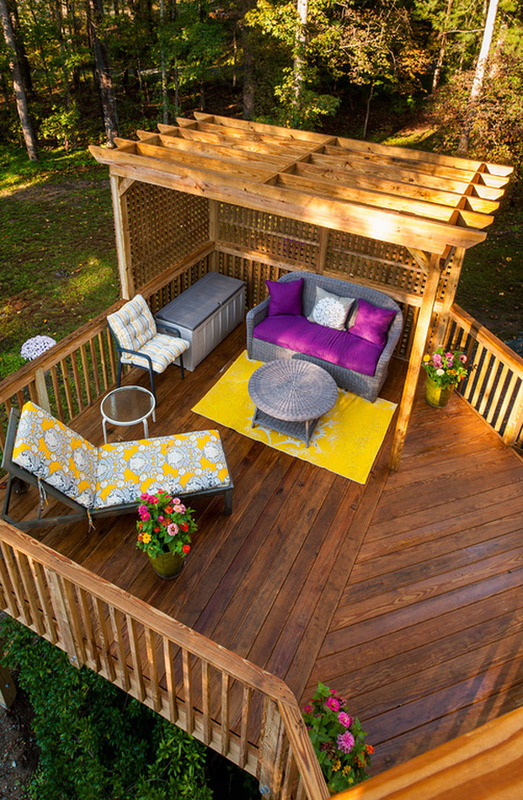 The cost of building a big wooden gazebo can reach $10,000. The furniture doesn’t seem expensive but it’s perfect for outdoor settings. The cabinets are made of wood which can be a problem if you live in high humidity areas or if you expose them to direct sunlight. The gazebo shields them from the sun though, so they won’t be a problem. The countertop seems to be coated in ceramic tiles, which are very inexpensive, only $5 per sq. ft. 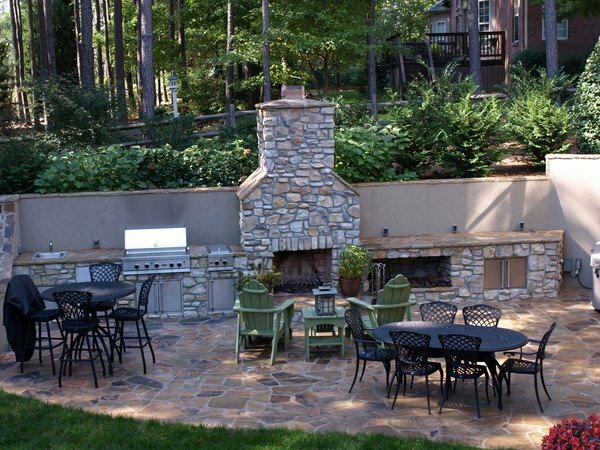 This outdoor kitchen is quite expensive because of the high walls that surround it. For example, the materials and labor costs of building a wall of 200 sq. ft. are at least $8,000 and can go up to $11,000. The floor is made of paving stones which is one of the best materials you can choose to install in an outdoor kitchen. This material is not easily stained and it doesn’t require much maintenance. On the rare occasion when it is damaged, you can simply replace that piece. Pavers are perfect to cover areas around the pool that are likely to be wet. The child gets wet out of the pool and runs to the outdoor kitchen. If the floor is covered in pavers he will not slip but he is bound to slip on tiles or marble floors. Here you see that the gazebo is built in the veneer and it therefore adds to the overall costs. It seems to be made of cement or concrete and it’s colored so that it matches with the other elements. The patio is made of pavers arranged in a nice pattern. Here’s a tip: you can lay the pavers in a zipper-like pattern in areas with heavy traffic. The stones here are more likely to require replacement. The zipper-like pattern makes it easy to remove the damaged pavers. A pizza oven that big is at least $5,000. Notice there is no refrigerator in there. This can be an option if you position the outdoor kitchen next to the indoor one. The kitchen island is small here but beautifully designed. The round shape of the framework matches perfectly with the shape of the small pool. Notice how the kitchen shape allows you to have everything at hand while cooking. You don’t waste time moving around. The limestone floor is exactly what’s necessary for a yard with a pool (see the slipping hazards I was talking about earlier). The countertops are made of natural stone. For example, 50. sq. ft. of natural stone countertop surface costs around $4,000. The grill is pretty big and probably costs several thousands of dollars. If you want to build the pool as well, there are several types you can choose from, the vinyl pool being the cheapest and the concrete pool being the most expensive one. The river rocks to the back of the picture blend amazingly with the forest surroundings. There is also a small fire pit to the right that would cost about $500 to install. 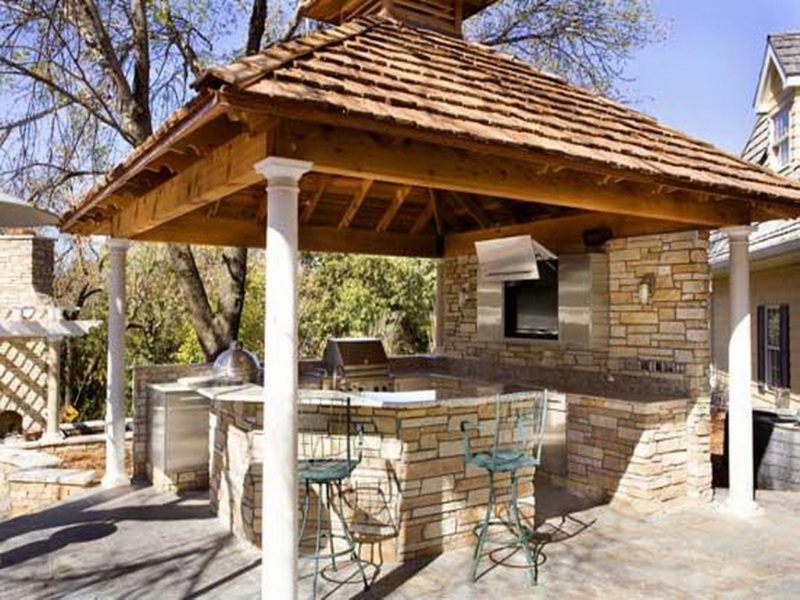 This small outdoor kitchen is sheltered by a gazebo which is the most significant investment. The stone wall and the veneer are the second most expensive elements, provided that you don’t buy the most expensive appliances. This kitchen is built on a concrete or stone floor, you can’t tell for sure by looking at this picture. The main advantage is that you don’t need a big yard to build this design. 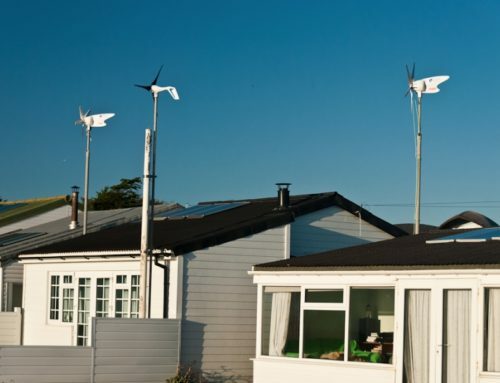 Moreover, it works perfectly for areas where the weather is either too sunny or too rainy: the roof provides shade and shelter from the rain. A few metal bar stools will give a vintage feeling to the whole construction. Natural stone veneer costs from $25 to $45 per sq. 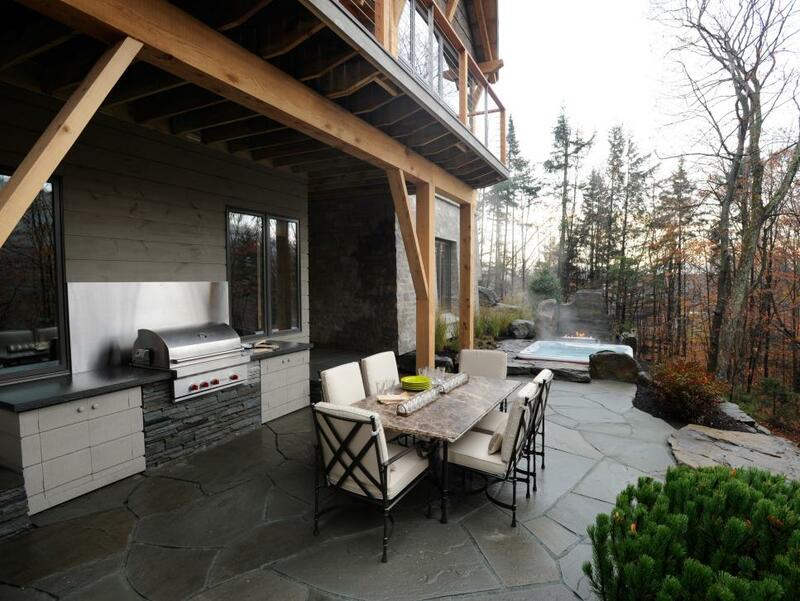 ft.
Before building this design, or any other outdoor kitchen for that matter, you should make sure the grill is well positioned so that the smoke doesn’t go toward the house. This is a truly complete landscape design. The kitchen is small and consists in a brick grill framework and a big pizza oven made of concrete and natural rocks. The rocks serve an aesthetic purpose. 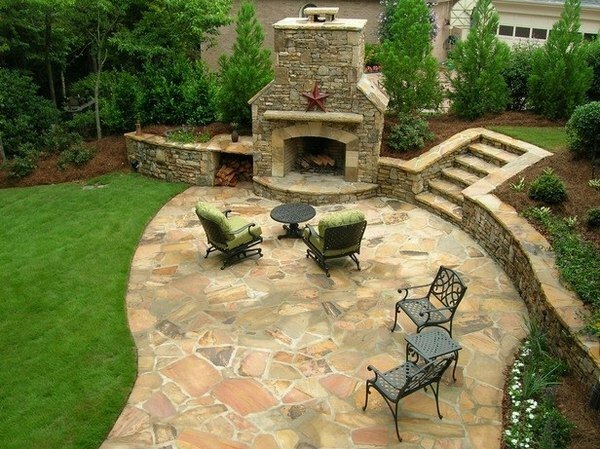 The patio is made of natural stone as well and costs about $25 per sq. ft.
Notice how the grass between the stones creates a pathway to the gravel area that has a small bench and some plants. A 5-gallon bag of pea gravel costs anywhere between $3 and $9. The bags usually contain mixed colors but you can also find single color bags of pea gravel for a higher price. 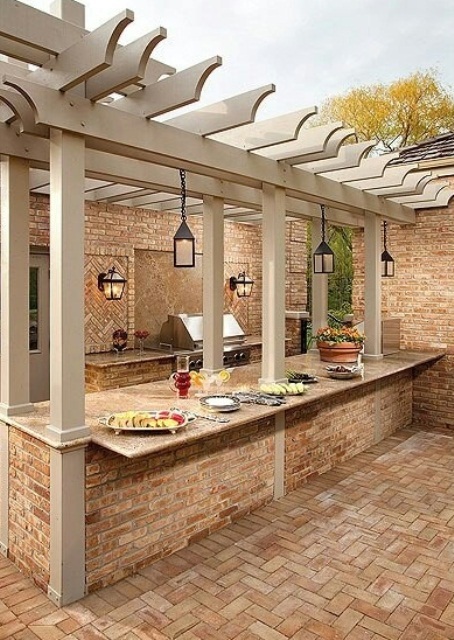 If you live in a warm state like California or Florida, the lack of a gazebo or pergola will impede you from using the kitchen in the middle of day. You would have to wait for the sun to set to start the grill. This design is quite minimalist and has a few futuristic features. For instance, the pizza oven and the grill veneer are made of uncolored concrete. The wooden deck is simple and dark colored to match the concrete. The square foot of redwood costs around $8. This wood is a good choice because it is fire resistant, a mandatory thing for an outdoor kitchen. It is not prone to warping and it can be easily colored in whatever shade you like. You can also consider a Brazilian hardwood called ipe, but the price per sq. ft. is significantly higher: $23. The table is not fancy and comes with benches making this landscape perfect for a comfy dinner with your friends. You can also lay in the chaise longs under the umbrella with a margarita in your hand after a hard day at work. This kitchen is space efficient and is strategically positioned near the hot Jacuzzi. When the hot bubbling water makes you hungry, it’s time to heat the grill and make some delicious burgers. The first floor balcony acts as a roof for the outdoor kitchen which is an excellent idea. The only appliance in this kitchen is the grill. This restricts the way you use it and forces you go back inside to use the sink, the refrigerator and the stove. The good thing is that the costs are highly diminished by purchasing only the grill. The countertop is made of granite or bluestone. You will pay $60 per sq. ft. for a granite countertop and less than $40 for a bluestone one. 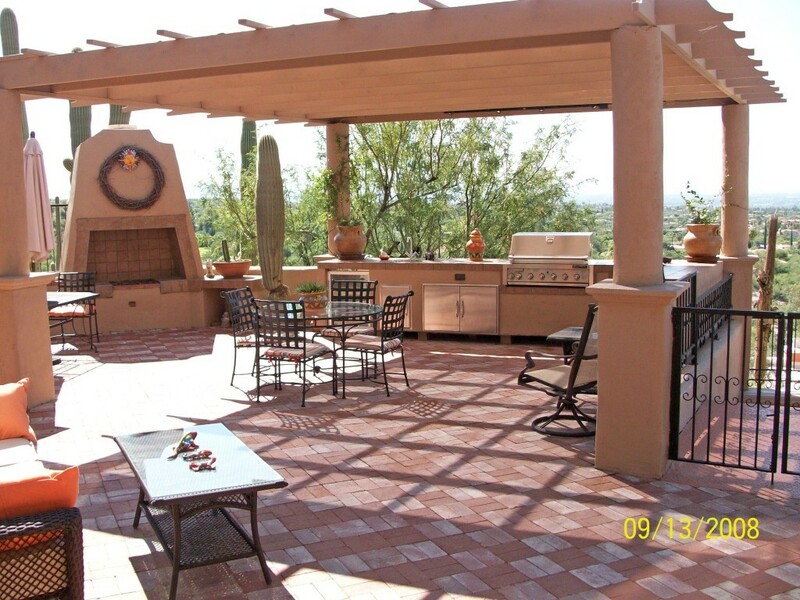 The patio is made of asymmetric tiles of natural stone that was dyed in gray to match the color of the house. 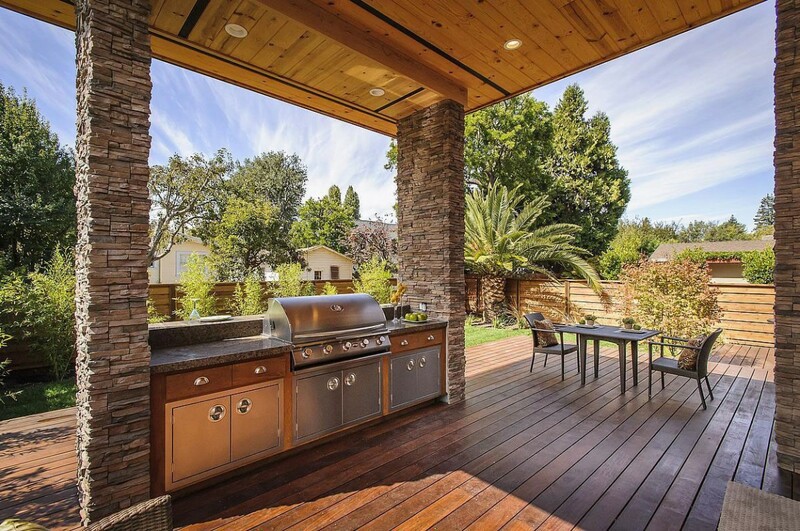 Who wouldn’t want a huge dining space with an outdoor kitchen? These people are lucky enough to afford it. The pieces of wood above the kitchen are quite cheap to buy and assemble into that beautiful pattern. Just make sure you are buying fire resistant wood. You can buy pressure-impregnated fire retardant treated wood to be safe. This kind of wood is mandatory to use for building interior or exterior walls in major metropolitan areas because they do not imply a fire hazard. The biggest investment goes to the building of the stone wall. I mean, it looks like a fortress. 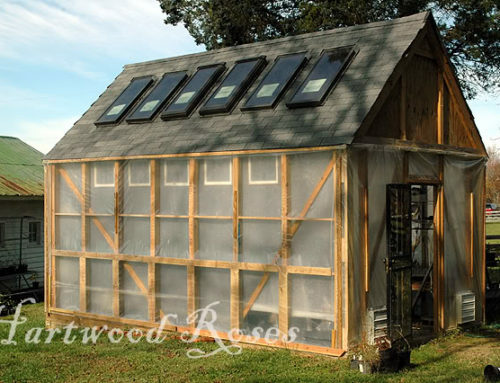 The total cost of materials and labor for building a 120 sq. ft. stone wall is close to $4,000. If money is not an obstacle, then by all means you should implement this design. It’s elegant, modern and above all else, 100% functional. The walls, pillars and roof are the main investments you have to make and could take tens of thousands of dollars. As for the floor, it can be made of tiles or marble. The materials and labor costs for installing a marble floor that measures 120 sq. ft. are at least $2,000. The cabinets are made of wood giving the entire room an elegant note. 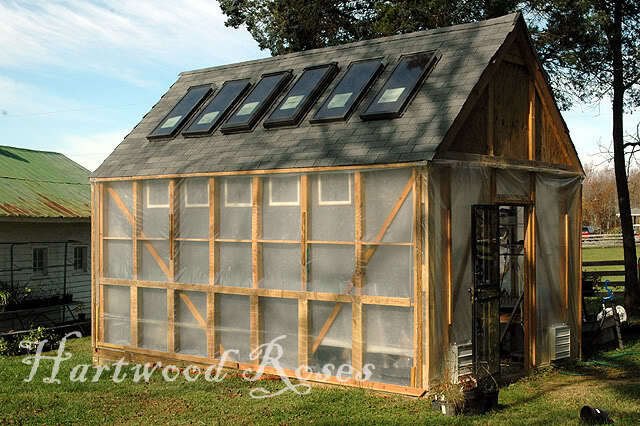 Since they are shielded from the sun, wood is a perfect choice if you don’t live in high humidity areas. You can see a big fridge next to the cooking appliances but there is no grill. The middle island table offers you plenty of space to prepare food. The countertops can be made of granite, which adds a nice finishing touch to the design. This design is suitable for any middle sized yard. You can see the grill and the wood fired oven. The river rocks add a special tone to the landscape. They are roughly cut to go with the rough aspect of the natural stone used for the floor. The rocks themselves cost 5-35 cents per pound. The range is so wide because there are many types of river rocks available, some cheaper and some expensive. Stone was used to build those small walls as well. They truly make the design more appealing. As for the kitchen, apart from the above mentioned appliances, there are no countertops, no refrigerators and no stove. 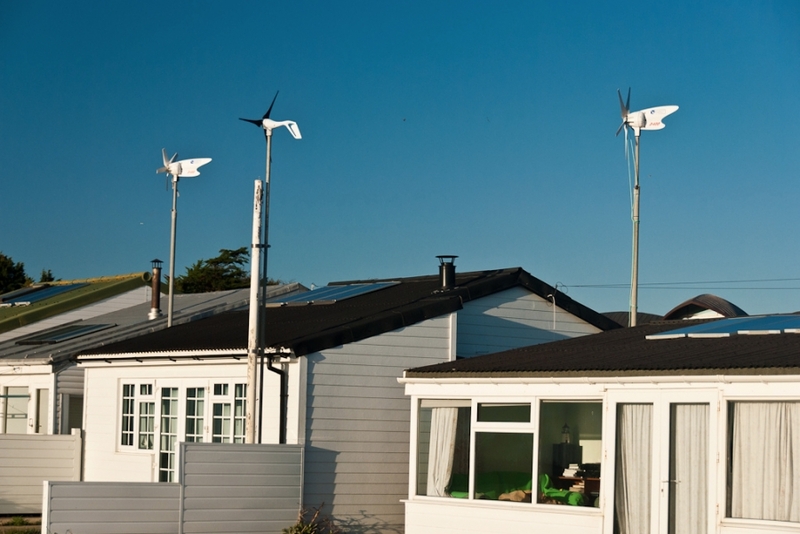 Lighting could be a problem as well unless you install some outdoor lighting facilities. 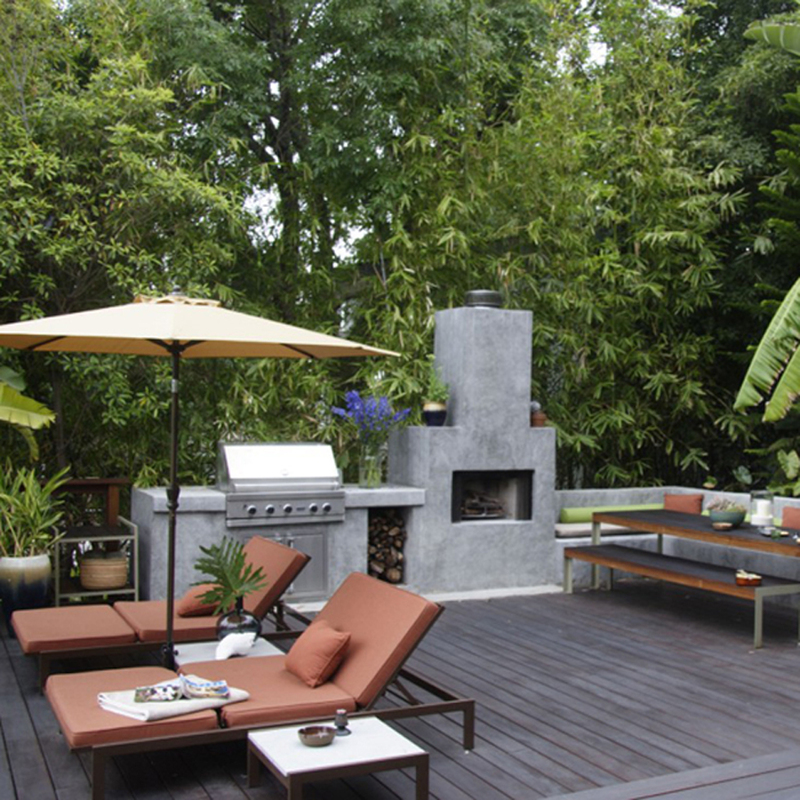 This outdoor kitchen is minimalistic as well. All you see is a wood fired oven but you can easily add a grill. 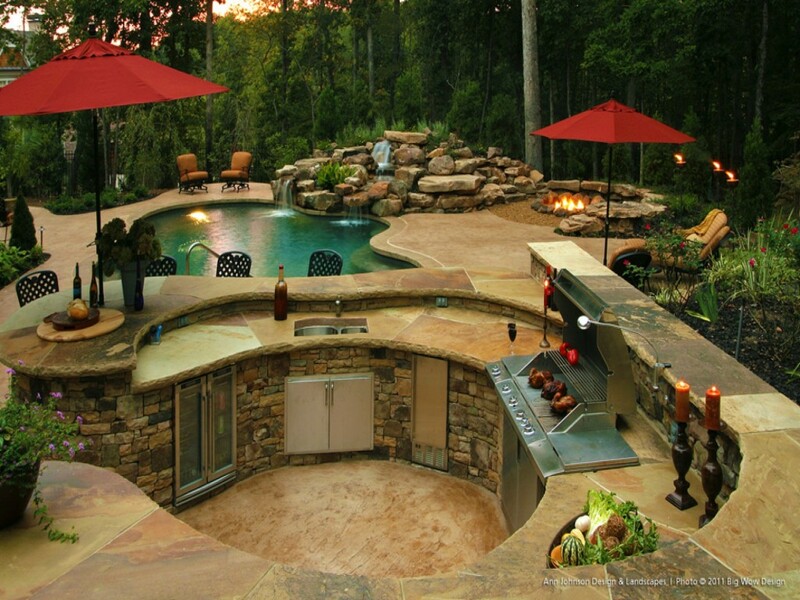 There is no sink however, but if the outdoor kitchen is right next to the indoor one, you will not mind this. 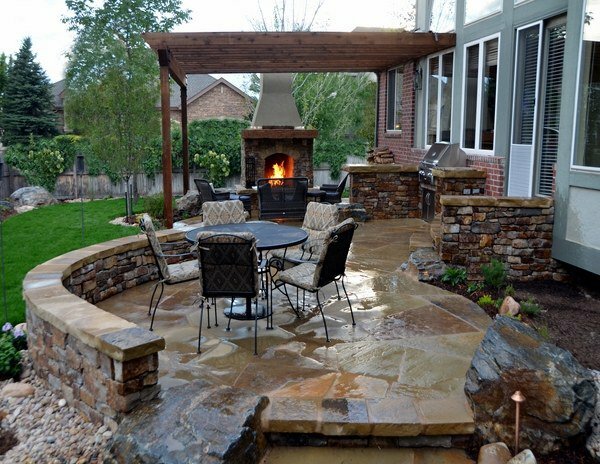 The patio is made of natural stone and you would pay for its installation about $7 per sq. ft. If you are not satisfied by the looks of ordinary manufactured tiles, you can choose designer floor tiles that are more expensive: around $30 per sq. ft. excluding the costs of installation. Another major investment for this design is represented by the oven. The small walls and the stairs will probably not be very costly. As you probably already noticed, this design is perfect for yards that are not leveled. Nonetheless, if you really want steps and you don’t have any higher ground in your yard, the landscapers will simply bring dirt to create some. This design meets the minimum requirements for an outdoor kitchen: a grill, a wood burning oven, a sink and patio furniture. The stone veneer gives a rustic look to the entire design. If you choose the appropriate patio furniture you will maintain that look or you can diffuse it by buying modern tables and chairs. The costs involved in building this kitchen are medium. The presence of the sink means that you have to take care of water pipes before laying down the patio. 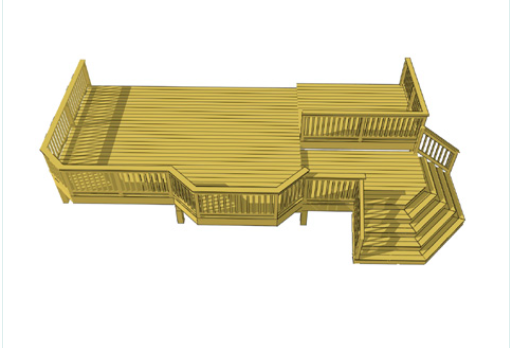 And last, here is the 15th outdoor kitchen design. 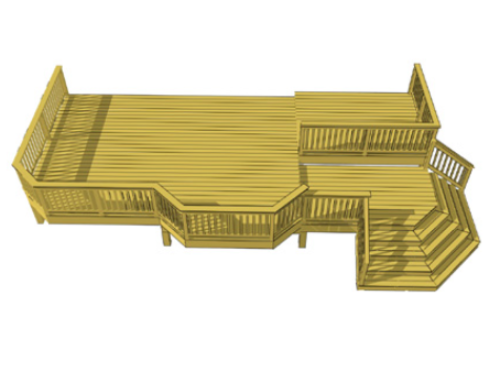 The deck and the roof are the major investments and they go well together. This kitchen is classy because it combines wood with stainless steel and granite. It’s minimalistic, but it still has a grill, a table with chairs and a countertop to get the delicious burgers ready to be cooked. There is a lot of empty space which makes it a perfect location for a party or small get together that involves dancing. I love throwing yard parties and so I want to get an outdoor kitchen built so that we can have a proper outdoor bar set into place, and your design ideas are really helping me visualize what I want. The gazebo is very charming and definitely good for rainy or sunny weather, as you said. Getting natural stone is already something I’ve decided to do for most of the construction, especially as we plan to have a grill put in place, so it’s good to know that the stone patio costs about $25 per square foot, as you said.